Bread is definitely a staple in almost every home. We generally always have a loaf of whole wheat bread in our fridge, as well as a few more in the freezer. I don’t feel like we eat that much bread, but we must as we seem to fly through loaves so quickly. I think we most often use it as toast. Wherever it goes, I refuse to pay more than $1/loaf, as I know that is the lowest price my local grocery store sells it for (when on sale of course). Additionally, we have a semi-local convenience store chain that sells freshly baked bread 2/$1.99 at all times. I try to grab a few loaves when I’m there so we always have some on hand, but inevitably we always seem to run out. Today, I decided to try my hand at bread again. 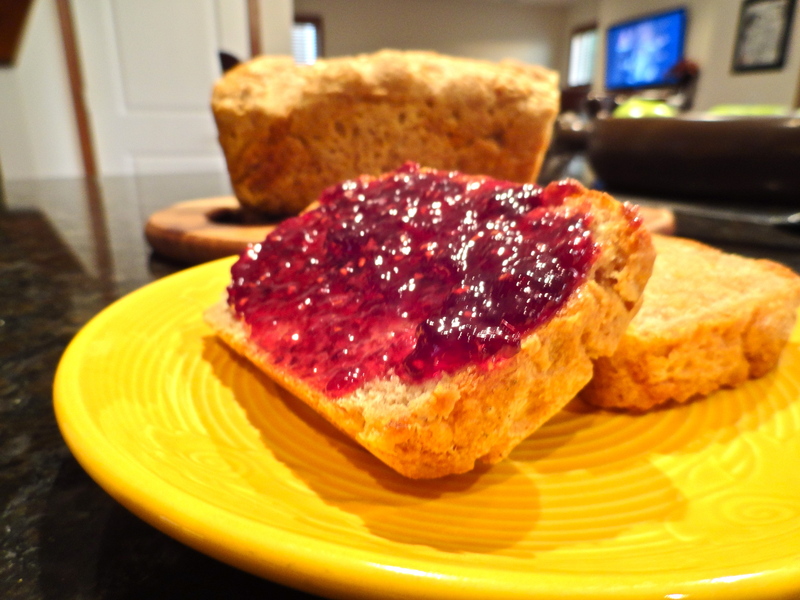 A few weeks ago, I made honey whole wheat bread for a recipe swap, but it didn’t really turn out so well. As I indicated in the post, I believe the recipe I was following might have been somewhat off, but who knows for certain. Anyway, this recipe was from Prevention RD, so I was confident I could at least get something resembling a loaf of bread! I think the original recipe may have been for two loaves, only because the measurements in Nicole’s recipe are unusual (I don’t have many 1/6 or 3/8 cup measurements ;)), but I made it work! I had quite a bit more success with this bread than the last one I attempted. It was super fluffy and delicious! I’ll be keeping this recipe handy for when we want some freshly baked bread on hand. 1. In the bowl of a stand mixer fitted with a dough hook, combine the hot water, olive oil, honey and sea salt. Add in 1 cup of flour and mix until combined. Add yeast and mix. 2. Add in 2 additional cups of flour and mix until the consistency is somewhat even, knocking the flour off the sides of the bowl if necessary. Slowly continue to add the remaining flour until the mixture stop sticking to the sides of the bowl, but is still tacky to the touch. You don’t want to over mix the dough, and you don’t want too much flour, otherwise your loaf will end up dense. 3. When dough is ready, let stand in the bowl and cover with a damp cloth. Let rise for 1 hour. The dough will be larger, but it does not need to double in size. 4. Preheat oven to 350 degrees. Spray a loaf pan with olive oil and coat with flour. 5. Punch down dough. Turn out dough on a floured work surface. Sprinkle top of dough ball with flour and begin to work into a ball. Turning dough over itself several times, work into the shape of a loaf and drop into your loaf pan. Bake for 30-35 minutes. 6. Once baked, turn out onto wire rack to cool. Slice and serve right away, or store in a paper bag, inside of a plastic bag for up to a week. I made a turkey sandwich with the first slices of this bread, with basil pesto mayo and sun-dried tomatoes. YUM! I couldn’t tell you the last time I had a pancake, before this morning. We rarely go out for breakfast, and when we do, I don’t get pancakes. But I like pancakes, so why haven’t I made them at home in years? As you may have noticed, I’ve been on a whole wheat kick lately, and I had whole wheat pancakes on my 30 Before 30 list. 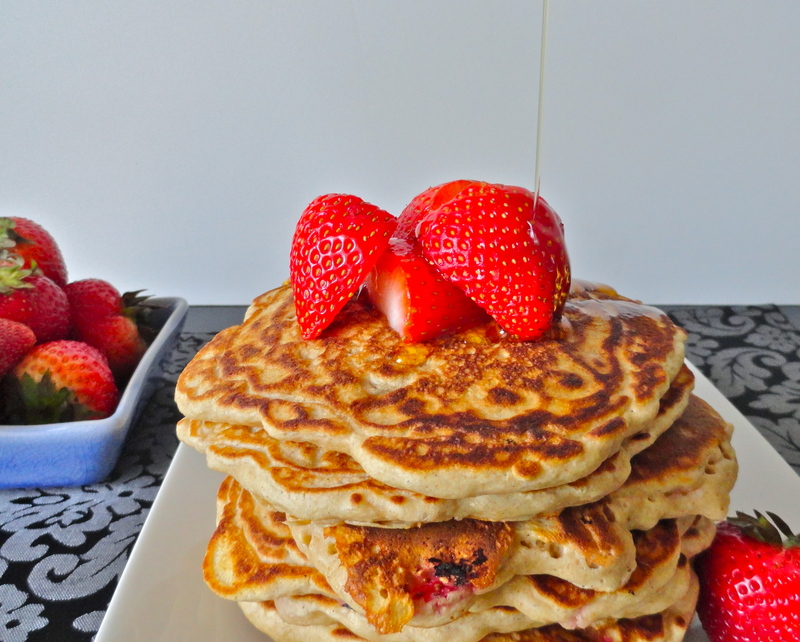 I saw these Raspberry Oat Whole Wheat Pancakes and thought they’d be perfect! Not only is today Independence Day, but it’s also Nate and my’s anniversary, so I thought I’d make a special breakfast. We were both already up and out of the house by 7 am, but I was looking forward to pancakes after my morning run! 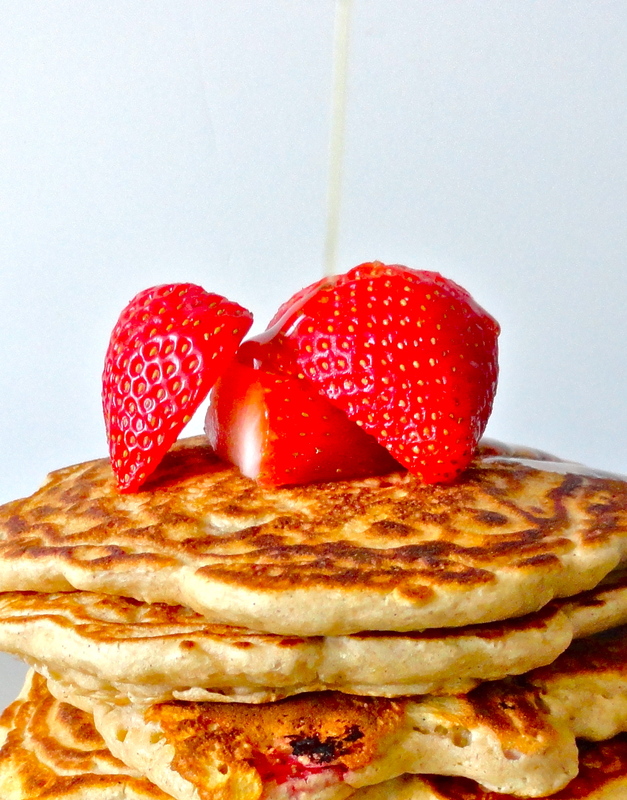 These are somewhat thick pancakes, but very filling, and even better, very healthy. The recipe made 8 pancakes, but I could barely put down two, and Nate struggled with this third. The hint of cinnamon is an excellent background flavor, without being over powering. Instead of raspberries, I used strawberries since they were on sale. They gave the pancakes the perfect amount of sweetness, and topped with just a touch of pure maple syrup, heavenly! 1. Add vinegar to liquid measuring cup. Add milk up to the 1 1/4 cup mark. Pour into medium-sized bowl and add oats. Set aside and let sit for 10-12 minutes. 2. Meanwhile, in a medium-sized bowl, combine dry ingredients: flour, baking soda, baking powder, cinnamon, and salt. 3. Using your stand mixer and whisk attachment, add egg whites to mixing bowl and whisk to soft peeks on medium until frothy and fluffy. 4. Heat griddle pan over medium heat and spray with non-stick cooking spray. Add vanilla extract to milk and oats. Whisk in dry ingredients until just combined. Add sliced strawberries and fold in egg whites. Using a ladle, add about 1/3 cup of the batter to the pan. Use the ladle to spread the batter so the pancakes don’t get too thick. Once they start to bubble around the edges, they are ready to flip, about 2-4 minutes on each side. Serve with additional strawberries and maple syrup. 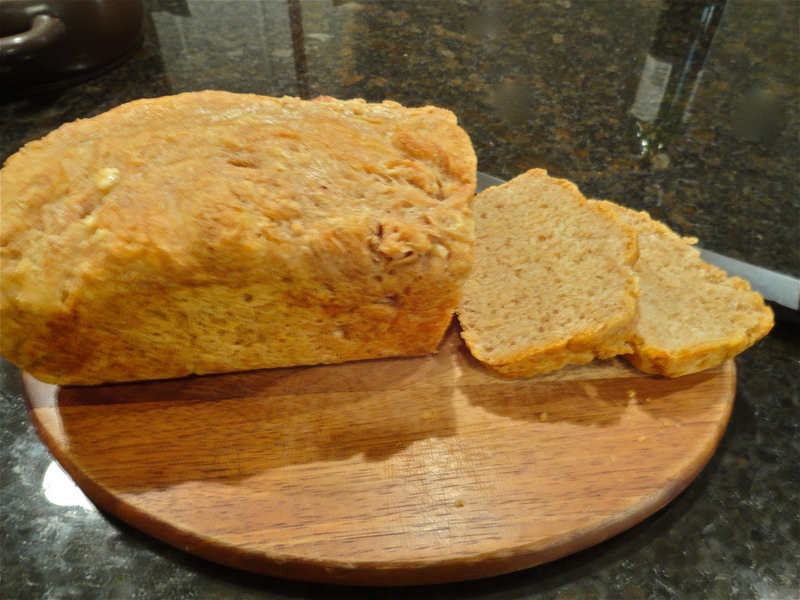 You may have noticed a trend in my blog lately: whole wheat. Well, yes, I do have a bunch of whole wheat flour in my freezer, so I thought I’d start getting creative and using it up. And it’s actually proved very well. Whole wheat english muffin bread was fabulous, whole wheat flour tortillas were excellent, and whole wheat pizza crust is no different. When I get around to making breakfast on a weekend, next up is whole wheat pancakes. Yum! 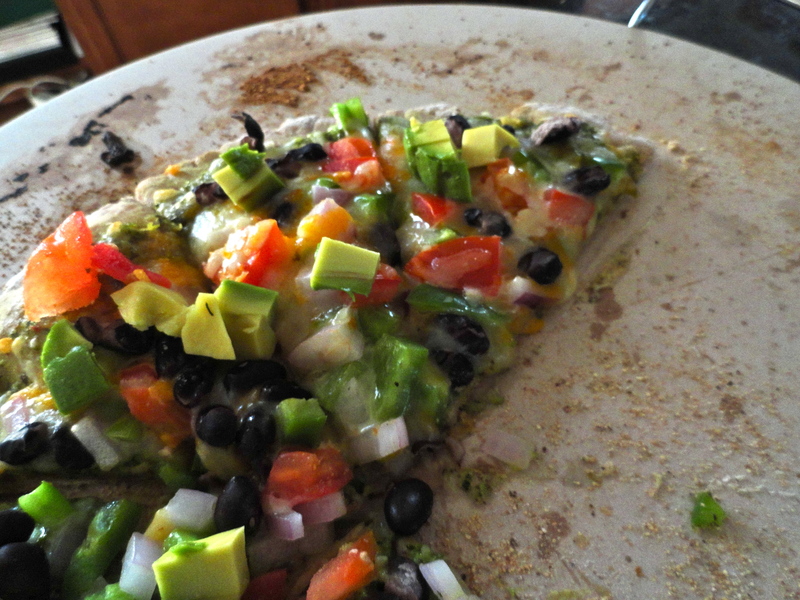 Anyway, the whole wheat pizza crust turned out really great. The dough was a little less forgiving than the regular dough, but I got the hang of it, and it tasted great too! Basically, it’s the same recipe as the grilled pizza dough, but substituting some whole wheat flour for the all-purpose flour. Substitute this for your next crust, and you won’t be disappointed. 1. In a bowl, dissolve yeast in the warm water, and mix in sugar. Proof for 10 minutes, or until frothy. Mix in salt, olive oil and flour until dough begins to pull away from sides of the bowl. Turn out onto a lightly floured work surface. Knead in herbs until smooth, about 8 minutes. Place dough in a lightly oiled bowl and cover with a damp towel. Let dough rise for one hour, or until it doubles in size. Punch down, and let rise for another hour, or until it doubles in size again. 2. Preheat grill temperature to about 350 degrees. Punch down dough and divide into four pieces. 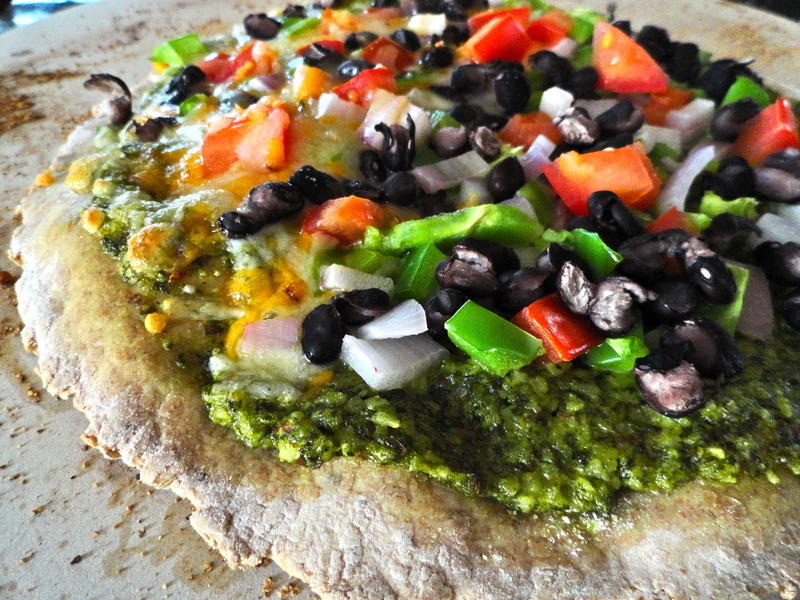 Make each piece into 9-10 inch square or circle pizza crust. If the dough isn’t working with you, leave it sit, walk away, and come back after 5 minutes. It’ll be more forgiving. 3. 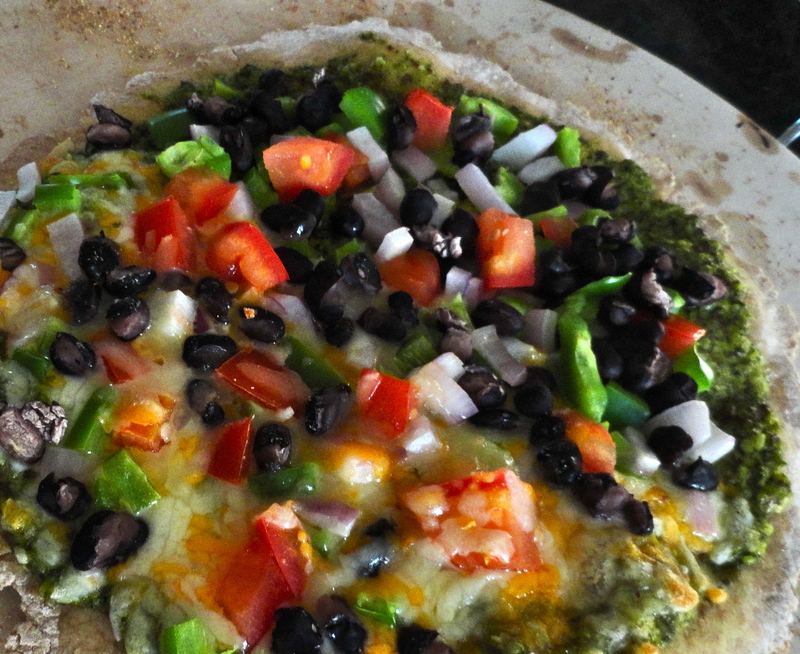 Have all sauces toppings, and cheese ready and waiting before you put the dough on the grill. Spray one side of two of the crusts with olive oil, and place one grill. Once on the grill, spray other side with olive oil. Turn the crust 1/4 of a turn every 30 seconds or so, until crust beings to brown and bubble, about 2-3 minutes. 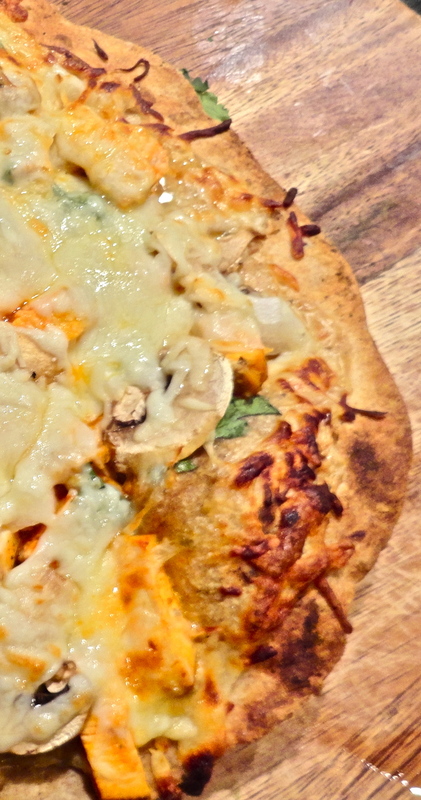 Flip crust and immediately top with desired sauce, toppings, and cheese. Close grill cover and cook for 3-4 minutes, again turning 1/4 turn every 30 seconds. Every grill is different, so timing will vary. Be sure to keep an eye on your crust so it doesn’t burn, but don’t flip it too soon – you want it to be cooked through and slightly crisp. repeat with second two crusts. This is the second time I’ve made this bread; the first time didn’t turn out so hot. It was tastey, however, very dense. I think I killed my yeast by using too hot of water – it didn’t really rise all that much. I had to try again as english muffin bread was on my 30 Before 30 list. I found a new recipe (as I blamed the first recipe rather than my own baking handicap) and even proofed my yeast before adding it to my ingredients. I’m no baking expert, so I won’t even begin to tell you the science behind proofing yeast, but I know it works. If you’re interested, here’s a great description from The Kitchn. I did add whole wheat flour instead of using all all-purpose flour. I also used brown sugar because I forgot I was out of sugar. Whoops! Boy was it good. Nate and I each had a piece after dinner to make sure it was tastey, and it sure was. The crust is nice and crunchy and the inside is fluffy and light with wonderful flavor. I can’t wait to make this bread again and add some fun flavors next time! 1. In a medium bowl, add yeast, water, and sugar. Proof for 10 minutes. 2. In a large bowl, add salt and both flours. Melt 1 tbsp butter and add to mixture. Once yeast is proofed, add to the flour mixture, and stir until just combined. Cover with a damp cloth and allow to rise for 1 1/2 hours. 3. Spray a loaf pan with cooking spray and transfer risen dough to loaf pan. Cover with towel and allow to rise for another hour. 4. Preheat oven to 350 degrees. Bake for 40 minutes. Remove from oven, and spread remaining 1 tbsp butter on top of loaf. Bake for another 10 minutes. Remove from oven and transfer to a wire rack to cool before slicing. 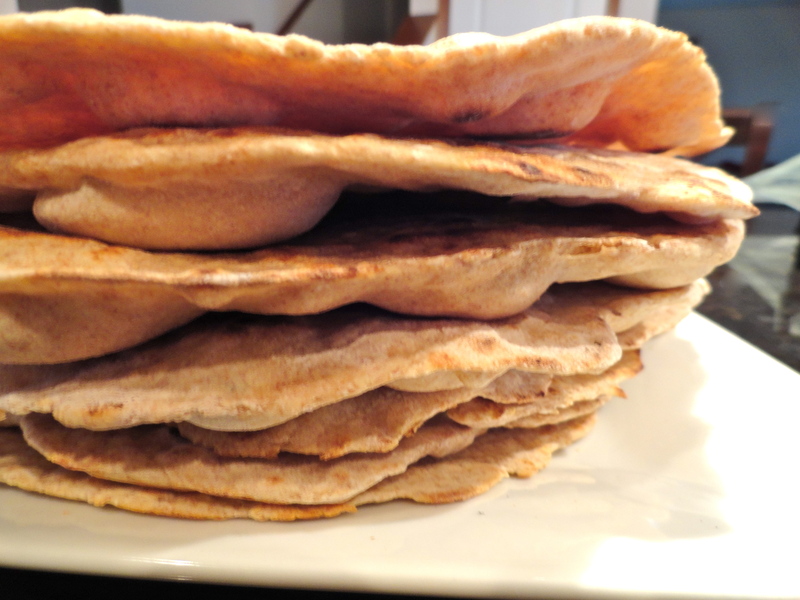 Flour tortillas was one of the very first things on my 30 Before 30 list, and Jessy at Gourmet: Day to Day inspired me to build up the courage and actually try it. Exactly as she says, it was so super easy. I doubled the recipe right off the bat because I knew we’d eat them up. However, I was doing so many things at one time, I forgot that I doubled it when dividing the dough, and ended up making 8 super large tortillas. Oh well. It’s not like we’re not going to eat them anyway! My arms got a little tired rolling out all the tortillas, but it was totally worth it. I think next time, I may..quadurple it? Tortillas are easy to keep in the freezer and take up almost no space. I love always having backups, so I will for sure be keeping these as a staple in my freezer. Next time I might use all all-purpose flour just to try it out, but this time I used half whole wheat flour, half all-purpose. I had Nate sample a little while I was cooking and he was playing baseball. He didn’t believe they were mine at first because the flavor was so good. Great compliment! If you think you can’t make flour tortillas, think again. These are a cinch! 1. In a large mixing bowl, combine both flours, baking powder, salt and oil. Slowly add warm milk. Stir until a loose, sticky ball begins to form. Dump out onto lightly floured surface and knead for 3 minutes, until firm and soft. Place dough in a bowl and cover with damp cloth or plastic for 20 minutes. 2. After dough has rested, divide into 8 even sections, and roll into balls. Place on a plate or baking sheet, making sure they do not touch one another. Cover with damp towel or plastic wrap for 10 minutes. 3. Once dough has rested, one at a time, place dough balls on lightly floured surface, and pat out into four inch circles. Then, using a rolling pin, roll out from center until its about 8 inches in diameter. Do not overwork the dough or it will become stiff. Keep rolled out tortillas covered with damp cloth until ready to cook. 4. Heat large dry skillet over high heat. Place rolled out dough in pan, cook for 1-2 minutes, until it begins to puff up, then flip, and cook for another 1-2 minutes. Repeat for reamining tortillas. Keep cooked tortillas wrapped in napkin until ready to serve. If freezing, let cool, then place in large freezer save zip top bag. To reheat, place in oven wrapped in foil or in dry skillet to warm through.